It’s hard for me to imagine anyone who doesn’t love a good candle. I mean, I’m sure there are some people out there… somewhere… I happen to love candles in all forms, shapes and sizes. But good candles… really, really GOOD candles… are just the bee’s knees. And luxury candles are just the cream of the crop if you ask me. Beautiful, functional, soothing and a bit out of the ordinary ”“ what’s not to like? What a joy it was to be asked to review Aura Candles. Once you visit this website, you’ll see it’s all I’ve mentioned and more. There’s a beautiful simplicity to the entire website, which lends to the relaxed, soothing atmosphere. 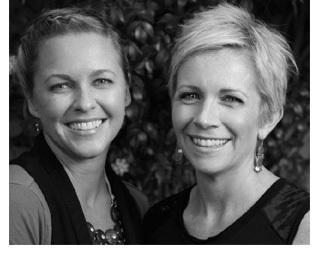 The founders of Aura Candles, Jasmine and Chelsea, sound like a dynamic duo with many things in common ”“ including the love of high quality, beautiful candles. 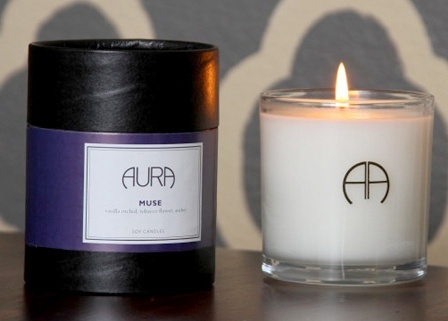 It was through their collaboration that Aura Candles was born. The candles they have managed to create are higher end (but certainly not unreasonable) and quite unique. The scent list is not huge (ten at the time of this review) but honestly in this case, that’s a good thing. The scent names and descriptions can be savored, mulled over, relished. Scent names – such as Facade, Sublime and Cosmic ”“ leave you wanting to know more. All their dye-free soy candles are 10 oz in size with a reported 70 hour burn time. It was good to know that these are fairly slow-burning candles, making the cost all that more reasonable! What did my candle look like? I received my candle in pristine condition since it was so well packaged. Once I opened my package, I was able to see the beautiful container that these candles come in. A sturdy round black box with the Aura logo clearly identified on the top of the container. A colorful label around the box clues you as to what’s inside. I was sent Cosmic for review ”“ apparently one of the bestsellers for this company. It had a beautiful subdued orange label on the box. Inside, the candle itself was a creamy white wax housed in a thick-bottomed round glass container. The only marking on the outside of the candle was the Aura Candles logo. Simple elegance at its best! Wow – what a nose-full! Reading that description, my immediate thoughts were that this scent should be somewhat exotic, sultry and citrus-y at the same time. So I took my first sniff. Whoa! Cosmic was all that and more!!! The cold sniff was simply (forgive the pun) ”“ out of this world! I am never sure if I can pick out individual notes when there is a mixture such as this, so I was anxious to start burning this candle to see. I used this candle in my “testing room,” which happens to be the smallest room in my house. I always like to see how candles will do there first before giving them more responsibility. So I lit this candle enigma and left the room for approximately 30 minutes. When I returned I was amazed that this candle had already started churning out its scent. Overpowering? No. But it filled my powder room and nose easily with pure candle goodness. The blood orange was definitely detected first. A tangy, citrus scent that, while prominent, did not overtake the other notes in the candle. I love citrus scents but sometimes they can be too harsh. I think the vanillas mellowed the blood orange out a bit, making the scent mix very pleasing to my nose. The mix of vanilla bean and vanilla orchid? Pure genius, in my opinion. The vanilla scents were pure and deep and simply intoxicating at times. The amber added a smokey sexiness to the overall scent that made me just want to swoon. It took a good hour before all the scents could be detected well, but it was definitely worth that wait! This was a slow-burning candle, which I really appreciated. Longer for me to enjoy the scent! The wick was lead-free and I never had any trouble lighting it or keeping it lit. Because it was such a slow-burning candle, it did take a relatively long time to get a full melt pool but I did obtain that with no problem. This candle was totally low-maintenance. I didn’t have to continually trim the wick or trim off carbon balls. I didn’t see any smokey soot nor was there any around my candle rim. A clean burning candle to say the least! The candle burned well all the way down to the bottom of the container so no wax was wasted. I love “discovering” new-to-me candle companies and this journey was no exception. I found the candle I tested from here to be of high quality with an exotic scent (exactly what I expect from higher end candles). The absolute best part to me is that this candle lasted such a long time. It totally makes the purchase worth it! If you have a chance to check them out, I encourage you to do so. I don’t think you will be disappointed! 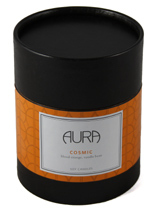 Have you tried Cosmic from Aura Candles? Review it with us. In the comment section below, review and star rate your experience… it’s easy!